The bugle is one of the simplest brass instruments, having no valves or other pitch-altering devices. All pitch control is done by varying the player's embouchure. Consequently, the bugle is limited to notes within the harmonic series. The bugle is used mainly in the military and Boy Scouts, where the bugle call is used to indicate the daily routines of camp. Historically the bugle was used in the cavalry to relay instructions from officers to soldiers during battle. They were used to assemble the leaders and to give marching orders to the camps. The bugle is also used in Boy Scout troops and in the Boys' Brigade. The Rifles, an infantry regiment in the British Army, has retained the bugle for ceremonial and symbolic purposes. The bugle has also been used as a sign of peace in the case of a surrender. The JP Bugle is a traditional Bb bugle ideal for the last post and other bugle specific pieces of repertoire. This reliable instrument provides a clear and warm sound presented in an attractive yet understated finish. 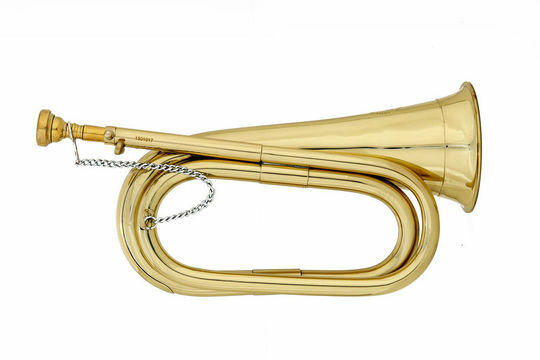 The JP bugle is constructed from yellow brass throughout and is available in both a lacquer finish or silver plated. It also includes a tuneable leadpipe to ensure accurate tuning as well as a 3.75” bell which is perfect for projecting the sound.